It's an easy app smash that you can do with your students to reinforce those rhyming words. This whole app smash came about after a conversation with one of my awesome colleagues, Mrs. Hansen. She had been having her students use the iPads in her classroom to scan a QR code that would display a word. Her students would then think of and recite a word or two that rhymed with the scanned word. 1. Create a whole bunch of QR Codes that link back to rhyming words (can, car, bat, etc.). Laminate them or store in a 3-ring binder in protective covers. I like to use QRExplore.com when needing to create a bunch of QR Codes at one time. It's an awesome tool for this. 2. Have students scan the QR Code. Let's say that the word that it's linked to is "bat." Now have your students open the Pic Collage app. 3. Let students customize their background as they really like doing this. Have your students add the word "bat" to their Pic Collage. Have them make this word fairly large by two finger pulling. 4. Now have the students add three words to their Pic Collage that rhyme with their original word. For example, I would add "cat," "hat," and "brat" to mine. Have students two finger pinch to make these words smaller and drag them to where they want them in their collage. 5. Now, let's have the students add an image from within the Pic Collage app. Have students add an image of their original word by tapping on "web images" in Pic Collage. Drag and place the photo that they choose. 6. Five finger pinch to close Pic Collage. (It's a simple move I teach all our students. If you have multitasking gestures enabled, simply take your hand with all five fingers spread apart and pinch them together quickly. This will close the current app, allowing you to work in another). 7. We are almost done. Why not let them create a drawing of one of the the words that is on their collage? 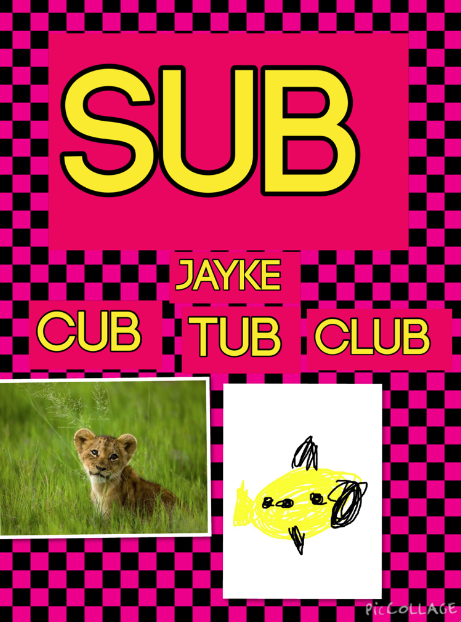 Have them illustrate one of the words using the Doodlebuddy app. When they are done with their drawing have them save it to their photo album. 8. Double tap your home button to reveal apps that are open. Choose the Pic Collage that we have been working in. Tap to make it full screen. Add your Doodlebuddy illustration by tapping on "photos" and adding it to your Pic Collage. 9. Have students add their names. Now, you could save this artifact to your library so that we could embed it into a future blog post using KidBlog or you could simply have your students email it to you so that you could do whatever you like with it! I was just wondering of a way to use Text based QR codes and Voila, here is a simple project. Love it!